Jennie-O Recalls Ground Turkey Following One Case Of Illness From Salmonella Over 45 tons of meat could potentially harbor the food-borne illness, the USDA said. More recalls from other companies could follow, as the government tracks a widespread outbreak of the same strain. Jennie-O Turkey is recalling over 91,000 pounds of ground turkey in connection to one illness from salmonella. The strain involved has been linked to a yearlong outbreak of 164 cases of illness, including one death, in 35 states. The USDA has said more product recalls from different companies could follow. The first illnesses related to the strain began in November of last year, according to a CDC investigation. Jennie-O stressed in a statement emailed to NPR that its voluntary recall, announced Thursday, is limited to ground turkey from "one production line from a single day's production." The products that have been recalled were produced on Sept. 11 and have a "use by" date of Oct. 1 or Oct. 2, but the Food Safety and Inspection Service arm of the USDA is concerned about meat frozen by buyers. 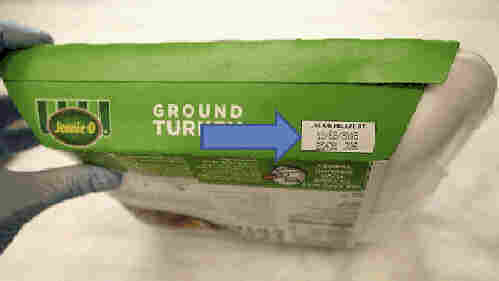 The one-pound packages of ground turkey affected include two varieties of plain ground turkey, 85 percent lean and 93 percent lean, as well as packages labeled either taco or Italian seasoned. The company has provided detailed instructions on identifying and returning recalled products. Jennie-O Turkey Store president, Steve Lykken, said in a statement that the company was told by government agencies the strain was found in 29 different manufacturing plants used by 19 different companies. The one death linked to the outbreak occurred in California, while Minnesota has the most confirmed cases, according to the CDC. Jennie-O and government agencies urge consumers to prepare poultry safely. Precautions should include washing hands before and after handling, cooking and reheating to 165 degrees before eating, and thawing frozen meat in the refrigerator, in the sink with cold water changed every 30 minutes or in the microwave. "Never thaw your turkey by leaving it out on the counter," the CDC says. The CDC says signs of illness from salmonella can include diarrhea, fever, and stomach cramps. Symptoms could take 12 to 72 hours to develop after exposure and illness usually lasts 4 to 7 days. Vulnerable populations include those under 5 and over 65 years of age and people with weakened immune systems, however, "most people recover without treatment."